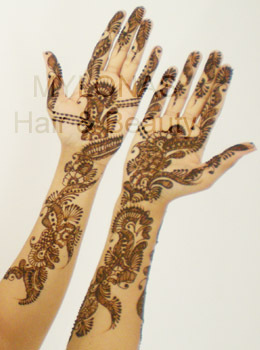 Colors, festivities, celebration - Henna ⁄ Mehndi symbolizes all of it. 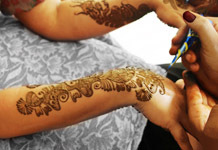 We are specializes in custom henna designs and temporary tattoos for corporate events, private parties, baby showers, festivals, wedding ceremonies & birthday celebrations. Come and experience the beautiful body art at Mylonas Hair & Beauty. Henna is a great way of adorning the hands, feet and body to celebrate beauty, health and prosperity. The sands of time have left behind this unique art form, which has been faithfully passed on from one generation to the next. To the West, it is a temporary tattoo. To the East, it is about women, celebration, hope, transition, growth, auspicious, spirituality, fortune and above all pure beauty. Traditionally for centuries, Henna (Mehndi) has been drawn on brides to symbolize love, happiness, prosperity and harmony for the couple. 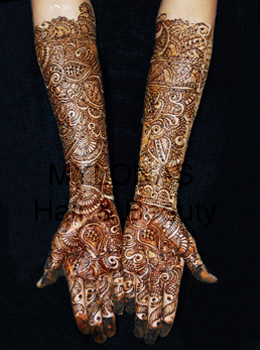 Historically henna art is considered to belong to the female domain, so bridal henna is the celebration of embracing the bride to the groom’s family. Henna, which is plant derived, is a popular way to color or dye hair, is all natural and harmless. we provide our clients with the purest ayurvedic henna powder. We add natural herbs such as amla and shikakai for richer color and shiny, healthier hair. The benefit of henna hair color is that it strengthens the hair, conditions, controls dandruff, protects and leaves hair shiny and manageable. Henna tends to fade more gradually and naturally so it’s the perfect color process to cover gray. We recommend you perform a strand test before using any henna products on your hair to be sure you like the color and results. Remember, when using natural henna on your hair, your results will vary and be uniquely yours depending on hair type and condition.